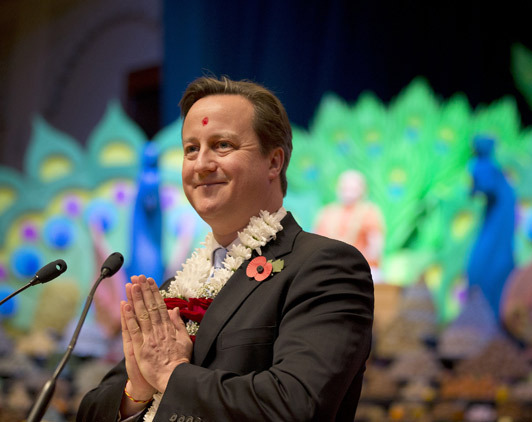 Hindutva inspired Cameron gains victory to form Govt in UK. Kounteya Sinha | TNN | London | May 5, 2015:: One of London’s most famous Hindu temples has been accorded the same status as two of Britain’s most iconic tourist draws – the Stonehenge and the Big Ben. With just two days to go before Britain goes into polls, prime minister David Cameron is going all out to appease the Indian Hinducommunity in UK by saying that the Swaminarayan temple at Neasden is “a great British landmark” having the same stature as Stonehenge, the Angel of the North and Big Ben. During one of his campaigning trips, Cameron who has travelled to India thrice after taking over office in 2010 promised to visit the Akshardham temple in Delhi if he returns to 10 Downing Street as prime minister for the second term. This entry was posted on May 9, 2015 by Sanatan Dharm and Hinduism in HINDUISM SCIENCE.